Tucked away in the Himalaya to the north-east of India is a tiny country that has taken the world by surprise. About 40 years ago, Bhutan, then a medieval Buddhist kingdom, opened its borders and joined the modern world. But it did not lose the balance. Instead, it gained an almost mythical status, largely for its pursuit of an elusive concept—national happiness. So much so that an inspired UN General Assembly in 2011 adopted a resolution on happiness towards a holistic approach to development. The nascent democracy—Bhutan became a constitutional monarchy in 2008 after the fourth king Jigme Singye Wangchuck transferred some of his powers to the people—has rejected Gross Domestic Product (GDP) as the only indicator of a country’s standard of living. Instead, it became the champion of a new approach to development, Gross National Happiness (GNH). “The Constitution of Bhutan directs the State to promote those conditions that will enable the pursuit of Gross National Happiness,” the fifth king Jigme Khesar Namgyel Wangchuk said at his coronation in 2008. “To me it signifies development with value.” This model seeks to achieve a harmonious balance between material well-being and spiritual, physical, social, cultural and environmental health of people. The underlying methodology of GNH is solid. It is based on four pillars: sustainable and equitable socio-economic development, environmental conservation, preservation and promotion of culture, and good governance. 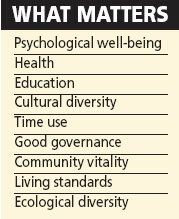 These pillars are supported by nine domains considered crucial for leading a good life (see ‘What matters’). These include often overlooked aspects like time use and psychological wellbeing. Keeping in line with the principles, the government has identified hydropower, tourism and agriculture as the bedrock of its economy. An estimate by Asian Development Bank in 2012 shows tourism and hydropower have helped Bhutan’s economy grow at 8.2 per cent between 2008 and 2012. Though agriculture has been the mainstay of its economy and two-thirds of its population depends on farming, only 2.9 per cent of the country is under agriculture. The government is not willing to expand farmlands by felling its abundant forests. Under GNH, it has pledged to ensure that 60 per cent of its landmass remains under forest cover in perpetuity; the current extent of forest cover is 71 per cent. There is no incongruity in this approach. Bhutan’s pledge to protect its forests stems from the fact that agriculture is closely linked to the health of forests in this fragile Himalayan region. Forests also keep watersheds healthy that are necessary if Bhutan’s ambitious hydropower programme is to bear fruit. Both proponents and opponents of hydropower agree that it is crucial for the country’s economic growth. Culture and pristine surroundings are Bhutan’s selling points to tourists. A healthy natural environment also ensures that people are spared abject poverty and stay happy. In GNH, happiness is not euphoria; it is a state of sufficiency, says Karma Tshiteem, secretary of the GNH Commission. GNH helps assess this state. “GNH captures the aspirations of people and is a tool to better design our policies.” The commission uses 22 indicators across the nine GNH domains to assess whether a project or policy ensures happiness to the people. It must score a minimum of three points to be approved, else is sent back for modifications. To guage the impact of its development approach, in 2010 the Bhutanese government conducted a survey. It shows only 10.4 per cent of the Bhutanese are unhappy. But has it been able to achieve the fine balance between economic growth, emotional contentment and environment protection after five years of following the principles of GNH? Down To Earth analyses Bhutan’s hydropower, tourism, agriculture and forestry sectors, urbanisation plans and foreign relations for answers. With steep mountains, deep gorges and numerous fast-flowing rivers, Druk, literally the land of Thunder Dragon, has set its sight on becoming a powerhouse in South Asia. Bhutan has already proved its potential—hydel plants have lit up nearly every Bhutanese home, irrespective of their location in the rugged mountain terrain. In 1999, only a quarter of households had electricity. “It is white gold for Bhutan,” says Chhewang Rinzin, managing director of state-owned Druk Green Power Corporation. With a potential to harness 30,000 MW from its rivers and streams, hydropower is now a great white hope for “green” income from selling power to India. Bhutan’s first tryst with hydropower was in 1967, when it built a 360 kW dam on the Samteling chhu (river) flowing by the capital city, Thimphu. “It started producing hydropower on a commercial basis only after 1974, when India offered to develop its hydropower sector and financed its first mega project, the Chukha plant,” says V P Haran, India’s ambassador to Bhutan. The country now has a mix of small, mini and mega hydel projects, which together generate 1,416 MW. Bhutan consumes 300 MW and sells the rest to India. 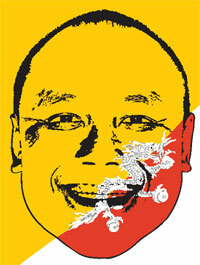 “India’s hunger for power has helped Bhutan expand its GDP by 8.6 per cent from 2008 to 2012,” says Rinzin. By 2020, Bhutan aims to generate more than 12,000 MW (India’s Tehri dam, one of the tallest in the world, generates 1,000 MW) from its four major river valleys. About 10,000 MW will be generated under a bilateral agreement with India, which will buy a major portion of this power. Construction work has begun on three projects—two on the Punatsang chhu and one on the Mangde chhu—which will harness 2,910 MW. Another six mega-projects and over a dozen of small and medium plants are in the pipeline (see ‘Powerhouse in a...’). Bhutan hopes that exporting hydropower will earn it the much-needed capital to finance social projects and achieve economic self-reliance. But the size and number of these projects have raised both financial and environmental concerns. The costs of Punatsangchhu I and II, for instance, have escalated by two and three times, respectively, since work began in 2006. About 50 per cent of this escalation is due to inflation and will be funded by additional loans from India. Worse, India has changed its financing strategy. Earlier, India used to finance Bhutan’s hydel projects with 60 per cent grant and 40 per cent loan. Lately, it has been offering 70 per cent as loan. This raises fears of debt trap. Allaying these fears, R N Khazanchi, managing director of Punatsangchhu Hydropower Authority, says India will buy power from the projects under construction at a tariff of Nu 3.4 per unit (ngultrum is tied to Indian rupee), which is much higher than the tariff of Nu 2 that India pays for power from the Chukha plant and the 1,020-MW Tala plant in Chukha dzongkhag (administrative division also known as district). These two plants are churning out profits. In 2008, Tala alone generated Nu 810 crore worth of power of which Nu 264 crore was sold to India to repay the loan and Bhutan retained Nu 550 crore. Khazanchi assures that even in the worst-case scenario where a project is 100 per cent debt-funded and there are cost overruns, Bhutan will make a net profit of 25 per cent. But what about the impact of several mega dams on the young and fragile Himalayan region? The country’s intelligentsia says the government’s push to become powerhouse of the region is at odds with its principle of environmental protection. 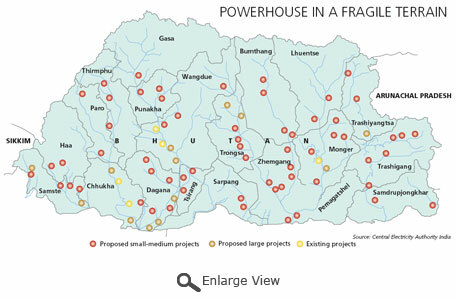 In March this year, national newspaper Kuensel carried an editorial saying, “While no one disputes that harnessing hydropower is the way to go, there is a concern that Bhutan is trying to do too much, too soon.” The government is yet to conduct a cumulative impact assessment of the projects. Punatsangchhu I and II, for instance, are being built on the same river. This could severely restrict the river flow, especially in the winters when the river carries 10 per cent of the monsoon flow due to snowcapped mountains. “Landslides are frequent in the Himalayan ecosystem, which makes construction risky,” says Ugen Lhendup, coordinator of the Royal Society for Protection of Nature’s (RSPN’s) environment education and advocacy programme. “We have to preserve its stability, else we will have to spend more on disaster mitigation,” says Lhendup, adding that some of the construction work is sloppy. He suggests that projects need to be staggered to mitigate their effects on forests and soil. Chime Wangdi, secretary general of non-profit Tarayana Foundation, offers another reason the government should stagger hydel projects. Since most projects are implemented by other countries, especially India, and international organisations, there is a great influx of foreign workers. This results in competition with local communities for the limited natural resources. Since work began on Punatsangchhu, an estimated 5,000 foreign workers have arrived in Punakha, a small town 13 km away. This is double the population of Punakha. “The town has changed completely. There is congestion, more buildings and cars now,” says Sonam Tashi, professor at College of Natural Resources in Punakha. Punatsangchhu projects have also affected wildlife, says Lhendup. RSPN’s study of the impact of the projects on white bellied heron, a critically endangered bird, shows the bird’s population has reduced to 20 from 200 in 2006. No hatching has been reported this year. Other mega hydel plants have affected the population of mahseer by blocking their seasonal migration for breeding. The dams are too large for fish ladders. Quarrying for rock, roads and house-building have also affected the fragile ecology. Hydropower is Bhutan’s asset, says Ugyen Tshewang, secretary of the National Environment Commission (NEC). “It is cleaner than thermal and is more in line with GNH.” Though Bhutan has a coal reserve of 1.3 million tonnes, it mines barely 1,000 tonnes a year for household use. Lam Dorji, executive director of RSPN, says since all hydel plants are run-of-the-river projects, displacement and submergence are minimal. Environmental conservation need not be an impediment to economic development, says Ugyen Tsechup, president of Bhutan Chamber of Commerce and Industry. For this, Tsechup suggests, the government should improve monitoring and conduct environment impact assessments. There is also an urgent need to expand NEC, he adds. Tsechup, however, holds a grudge against the monopoly of Indian companies and workers in the hydropower sector. Work that can be done by Bhutanese companies should be contracted to them with India transferring the knowhow, he says. Tsechup is right. 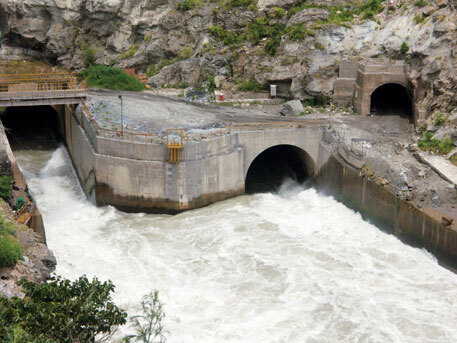 Bhutan needs to take stock of the way it is going ahead with hydel projects. Otherwise, it may end up lengthening one leg of GNH while shortening the others. Catalina Pedraza is a British tourist in Bhutan. She has just returned from Nepal and cannot help comparing the two countries. Nepal is crowded, noisy, polluted and a backpacker’s paradise. Bhutan, though expensive, is pristine and beautiful, almost ethereal, she says. Pedraza’s is a typical experience of a tourist for whom Bhutan’s culture and environment is the latest attraction. Tourists started arriving at Bhutan in 1974, when the isolated country opened up to foreigners. But lack of railways, limited roadways and flights in the steep mountainous terrain dissuaded them from visiting the kingdom. The real push came in the 9th Five Year Plan (2002-2007) when the Royal government made tourism a priority sector with a strategy to be high-value-low-impact. The sector received further impetus during the 10th and 11th Plans, says Thuji Dorji Nadik, acting managing director of Tourism Council of Bhutan (TCB). “We have opened three airports (apart from one international airport in Paro) and are improving road connectivity to the east so that people can enjoy Bhutan’s diverse culture and nature,” Nadik adds. In 2012, Bhutan received 105,000 tourists. This was one-sixth of the country’s population and a 65 per cent jump from the year before. TCB estimates that both directly and indirectly the country earned US $227 million, or 6 per cent of its GDP, from tourism that year (see ‘Potential driver of economy’). Most of the earnings come from foreign tourists (Bhutan does not consider Indians, Bangladeshis and Maldivians as foreigners). For this, TCB has a strategy. Typically, a foreign tourist has to book his or her itinerary through one of the 180-odd tour operators registered with TCB. Unlike Nepal where a tourist can get by comfortably on $ 40-50 a day, tour operators in Bhutan charge $200-250 a day for providing accommodation and food, travel, visa fees, tourist guides, permit fees and a royalty of US $65. This keeps numbers down and helps Bhutan control tourism which otherwise could overwhelm this country of 600,000 people. Though Pedraza returned home with a sense of contentment, she could not experience the rich culture and ecological treasure of Bhutan that lies beyond Thimphu and Paro. Bumthang is home to the country’s oldest monasteries and is bird watchers’ paradise. The rare black-necked crane can be spotted in flocks in its valleys. A tourist needs permits to visit this region. It may take two days in the high season to get a permit, which tourists find daunting. The permit, says Sonam Lhamo, officer at the check-post on the road to Punakha, is to check illegal migrants from India and Bangladesh. Even if one shows patience, he or she has to brave the rugged unpaved roads to reach this under-served region. Nadik says there is no dearth of visitors. “But we are still struggling how to manage tourists better. Tour operators are content with the status quo and do not want to set up hotels in less explored areas,” he adds. 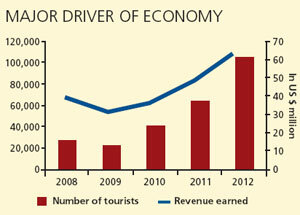 Tourism infrastructure is concentrated in three of the 20 dzongkhags: Paro, Thimphu and Bumthang. Though Bumthang has got an airport recently, the operator Tashi Air is yet to begin its service. “Expansion is not easy,” says Karma Lotey, head of Yangphel, a tour operator. Bhutan is one of the worst places in the world to do business. It ranks 143rd of 185 in the Ease of Doing Business list of the International Finance Corporation. Government clearances are cumbersome and time-consuming. The National Environment Comission (NEC) sometimes takes a year to clear projects. To top it all, turnover is small and profit margins low. “A tour operator earns a government-mandated 10 per cent on the entire package. Then we pay a corporate tax of 30 per cent. Where is the scope for expanding and adding new services?” asks Lotey. Nadik blames the delay in approval on shortage of staff. Despite this, he says, TCB has cleared 1,200 of the 1,500 licences it received far this year. Yet, 200 licensees have started operations. To fill the gap, non-profits like Tarayana and Royal Society for Protection of Nature (RSPN) are promoting home-stays. “This benefits communities while promoting Bhutan’s culture,” says Chime Wangdi, general secretary of Tarayana. For an exotic destination like Bhutan, tourism seems an attractive proposition. It has much to show, from culture to nature, treks to river rafting. If it gets around roadblocks like poor infrastructure and an apathetic industry, tourism can drive the economy. It will, of course, have to protect the environment so that it does not end up killing the golden goose. Poor it may be, but no one goes hungry in this kingdom. So goes the saying about Bhutan where farmers make a bare subsistence out of their land. Call it paucity of aerable land or the government’s pledge not to fell forests, over the years the average landholding of Bhutanese farmers has reduced. Today, more than 60 per cent people in the country live off just 2.9 per cent of land. Small wonder that the contribution of agriculture to the GDP has drastically reduced—from 17.1 per cent in 1999 to 8.8 per cent in 2011. Worse, the farmer fails to make the most of this land because farming is labour-intensive and of low intensity in this mountainous terrain. During winters snowfall renders some farmland uncultivable for four to five months. Due to lack of irrigation, people depend on rain-fed crops like maize, barley and millets and the staple paddy is restricted to lower altitudes. An estimate by the agriculture ministry in 2011 shows only 45 per cent households produce enough food and meet 60 per cent of income through farming. To meet the demand, Bhutan imports 40 per cent of its rice requirement from India, apart from cereals, vegetables and meat, says Douglas Schofield from the Royal Thimphu College. Given these constraints, the government is encouraging farmers to grow high-value crops like hazelnuts, mushrooms and vegetables. “People must be able to produce enough food for themselves and some for the market,” says Sherub Gyaltshen, secretary of the agriculture ministry. The ministry is training farmers on modern farming techniques and providing them with quality seeds. To improve market access it set up 465 road-side stalls in 14 dzongkhags and constructed more than 3,500 km farm roads, connecting 43,000 households during the 10th Five Year Plan, ending 2012. This was to address a critical gap: the International Fund for Agricultural Development estimates that 60 per cent farmers in Bhutan have to walk for at least an hour to reach the motorable road. But it led to more problems. “Contractors cut hillsides for the roads and dumped the debris on the mountainside. This caused landslides,” says Sonam Tashi, professor at College of Natural Resources, Punakha. “During the monsoons, many roads are impassable because they are poorly made,” he adds. Aum Dorji Choden, minister of works and human settlement, says improving farm roads is a top priority of the government in the 11th Five Year Plan. Though the government is toying with foreign direct investments (FDI) in agriculture to improve farmers’ lot, FDI is yet to show its effect. In 1998, Bhutan Agrotech Research and Development Organization, a joint venture between the government with several foreign companies, initiated commercial production of wasabi, a high-priced condiment. But the crop was not suitable for Bhutan’s climate and the project folded within three years. In 2009, Hong Kong-based Mountain Hazelnut launched a $30 million project to plant 10 million trees on degraded land. The company, which is distributing saplings for free, claims the venture would benefit 13,000 families. Once the trees become four years old and start producing edible nuts, it will buy the nuts from farmers at the market rate. “My hard work is finally paying off. The trees have started producing hazelnuts,” says Naku from Rangzhikhar village in Trashigang dzongkhag. Chime Wangdi of non-profit Tarayana says the project may affect farmers’ food security. “There is evidence that the company is expanding onto productive farmlands,” he says. Tashi and Wangdi suggest that Bhutan should focus on niche markets such as organic products. Organic farming is not new to Bhutan, though the term is. Some farms could meet production standards of organic agriculture by default. Tshependra Tamang, a farmer in Betneygewog of Tsirang district uses only compost to grow spinach and other vegetables. “I have never used urea and don’t know how to use it,” he says. Tamang sells his produce at his shed on the Tsirang-Gelephu highway, earning Nu 40,000 a year. Tamang is unaware that he is practising organic farming, and he is not the only one to do so. The ministry plans to explore this opportunity but it has to first overcome a few hurdles. One is a government policy that subsidises urea. Paucity of land means non-organic practices can easily contaminate organic farms. Third, farmers would go organic only if they are assured food sufficiency, water and chemical-free farm inputs. The government has to review its policies if it aims to ensure that farmers get better returns. Bhutan is perhaps the only country where the Constitution calls for keeping 60 per cent of land under forest cover for all time. Altitudes ranging from 150 to 3,400 metres provide immense climatic opportunity, offering sub-tropical to temperate and alpine vegetations. The government has declared more than 50 per cent of the forest as protected areas and wildlife corridors. Even in unprotected forests, felling of trees and harvesting of forest produce are strictly regulated. “Forests act as the support system for the country’s three economic pillars—hydropower, tourism and agriculture,” says Chencho Norbu, director general of the department of forest and park services (DoFPS). They are central to maintaining the health of the country’s watersheds that drive its hydropower sector; an estimated 80 per cent of the river water comes from groundwater as it seeps into the river. The pristine environment that attracts tourists is because of these forests. Agriculture, which employs two-thirds of its people, is closely linked to the health of forests. Given the fragility of Himalayan ecosystem, degraded forests result in soil erosions, spelling a doom for agriculture. This conservation comes at a heavy cost, says Tshering Phuntsho of Centre for Bhutan Studies, a research institute in Thimphu. Since farmers are not allowed to kill wild animals that damage their crops, man-animal conflicts are increasing. “I grow vegetables and corn on my three-hectare farm. Every season wild boar raid my fields, leaving me with practically nothing,” says Sonam Dorji, a farmer near Dorchu La, 30 km from Thimphu. “I am helpless since shooting is banned.” The government has tried passive measures such as crop insurance, electric fencing and cash compensation. Media reports show in the mid-1990s, almost a quarter of the farmers in Zhemgang dzongkhag stopped growing rice, while 39 per cent abandoned dry-land agriculture because of human-wildlife conflict. In Trashiyangtse dzongkhag, 14 per cent of farmers migrated to cities in search of work. Government records show 32 per cent people in the country are poor; 90 per cent of them live in rural areas. A non-compromising government is now encouraging farmers to join community forestry, so that their basic needs can be fulfilled. 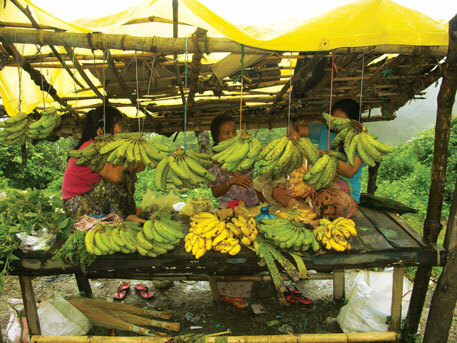 Under the National Forest Policy, a family gets 2.5 ha forest to manage for 25 years by paying a royalty of Nu 22 a year. The ministry provides seedlings and training to manage the patch. The family can procure non-timber forest produce like lemon grass and gooseberry as per their will and harvest timber after necessary approval. The idea is not new to Bhutan. In 1979, a Royal decree called for involvement of communities in planting trees. Since then, the government has framed several policies to rope in communities in forest management (see ‘People’s forest). But community forestry is yet to take off in this forested country. Sherub Gyaltshen, secretary of ministry of agriculture and forests, says communities manage 1.8 per cent of the national forest cover, which provides food, shelter and income to a quarter of the country’s rural household. At least 12 per cent of forest cover should be under community management by 2020. The government may not be able to achieve the target. Pema Wangdu, director in the Watershed Management Division (WMD) of DoFPS, says people are reluctant to join community forestry due to complex rules that regulate access to forest resources. For instance, it takes a member of community forestry management group (CFMG) several weeks to get approval for felling a tree. “This often leads to illegal logging,” says Douglas Schofield, Royal Thimphu College. Besides, community forestry in Bhutan offers only a subsistence income to people. There are very few forest-based enterprises for generating additional income, shows a survey by Ugyen Wangchuk Institute for Conversation and Environment. Because of lack of awareness, CFMG members in Woku Damchi village have remained timber sellers instead of making furniture and earn more from it, says Tashi Samdrup of WMD. Poor access to markets also stymie CFMG’s attempts to sell timber. The Zhasela CFMG in Lhuenste dzongkhag has overcome the hurdle by appointing a marketing agent who negotiates rates with potential buyers. In two years the CFMG has earned Nu 3,89,000 from timber. Even the ministry, which holds the rights for commercial logging in 10 per cent of the forest cover, has one small forest-based industry. Bhutan Particle Board Limited uses saw dust and chips to make particle boards at 119 saw mills across the country but operates below capacity. Factory manager in Phunseling, P K Sharma, says the annual sales in 2012-13 were Nu 8 crore against a target of Nu 10 crore. Several non-profits, including Tarayana, are now providing to CFMG members to add value to forest produce. Bed posts and woven products from cane and bamboo fetch three to four times the price of the raw material in Bhutan. Tarayana’s secretary general Chime Wangdi says community forestry is an important cog in the wheel to reduce poverty. But it would not help until the government trains people how to add value to forest produce and changes its policy accordingly. With creeping urbanisation, can the kingdom find a middle path to development? Thimphu, the capital city of Bhutan, resembles a fairy-tale town. Situated at an altitude of 2,500 m, the city stretches in a north-south direction for about 14 km along the banks of the Wang chhu (river) and is home to about 130,000 people—this is 40 per cent of the country’s urban population. 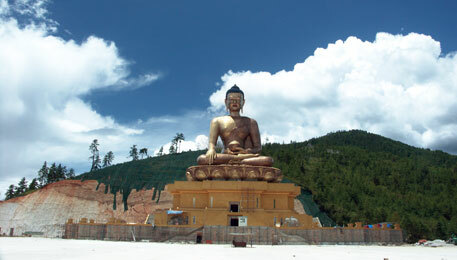 A recently built statue of Buddha overlooks the city, the country’s largest. The second largest is Phunseling. Over the years, the largely rural country has lost charm for its people who are migrating to urban areas, especially to Thimphu. 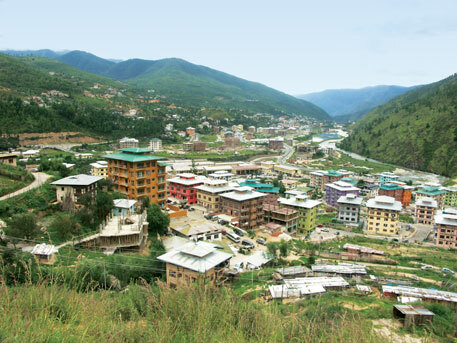 Since 1961, Thimphu has expanded about seven times. Even at its current size, the city may not be able to accomodate the future population, which, the government envisages, will be 162,000 by 2025. Kinlay Dorjee Thrompon, the first elected mayor of Thimphu, wants to avoid the ills of other South Asian capitals: over-crowding, pollution, crime and shortage of basic menities, and has prepared a plan to ensure balanced and equitable development. 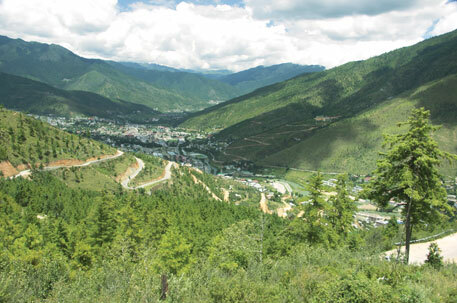 “Thimphu Structure Plan (TSP) will balance the economic development with environmental and socio-economic concerns, and place the growth of Thimphu in harmony with Gross National Happiness,” Thrompon says. Owning land or housing is seen as critical for happiness of Bhutanese residents. The government is thus expanding the size of the city to create space for housing and industries. It has zoned the city for residential, commercial and institutional or government use under local area plans (LAPs). These clustered neighbourhoods will be connected by public transportation to reduce the use of personal vehicles, which not only congest the roads but also cause pollution. Of the 12 LAPs, the Asian Development Bank is funding five to the south of the old city. This includes projects to expand the road network, sewage, drinking water and power supply. The World Bank has funded five LAPs to the north of the city with a similar spread of activities. The core area is being managed by the Thimphu City Corporation. The municipality is also setting up garbage disposal system to avoid unnecessary contaminations in the fragile ecosystem. Given that the country is nestled in the earthquake-prone zone of the Himalaya, TSP limits the height of buildings to five floors. This will also give uniformity to the city, says Karma Lotey, a real estate developer. Thimphu does not have traffic lights and is serviced by a motley mix of mini-buses and taxis. But the number of vehicles is fast growing—from 17,000 in 2005 to nearly 40,000 at present. This will soon lead to traffic jams on the arterial Norzim Lam given the city’s strategy to develop around a single axis. Decongestion is one of the mayor’s concerns and he is trying to improve the public transport as a long-term solution. Thimphu cannot meet the principles of GNH as long as its people are unemployed. At least 5.4 per cent people in this capital city are unemployed compared with 2.5 per cent for the country. Aum Dorji Choden, minister of works and human settlements, says the government plans to expand tourism and private industry to create jobs. Currently, the government is the largest employer in Thimphu, providing 40 per cent of jobs, followed by tourism. But given the high rate of urban migration, the mayor and the minister have little time to implement their plans on the ground. Bhutan is marching forward, saying happiness is much more important than economic growth. When global recession sent growth plunging in many countries, Bhutan witnessed a GDP growth rate of 8.2 per cent, according to an estimate by the Asian Development Bank in 2012. Back in the 1980s, Bhutan was much poorer than India. Today, Bhutanese are richer than Indians: In 2012, its per capita GDP was $2,986 against India’s nearly $1,500. India is a major factor behind the country’s growth and happiness. A lot of this GDP growth was spurred by giant hydropower projects that India has been building in Bhutan for four decades. India also “advises” it on its foreign and defence policies. India’s grants fund Bhutan’s Five Year Plans; it supported 74 per cent of the 10th Plan and 20 per cent for the 11th Plan. The Border Roads Organisation’s Project Dantak builds and maintains most roads in Bhutan. In 1961 it built the first all-weather road in the country between Phunseling near the Indian border and Thimphu. India also provides petrol and cooking gas to Bhutan at the same subsidised rates at which it provides to its own population. Bhutan is so dependent on India that the withdrawal of subsidies on petrol and cooking gas between the two rounds of polling this year spurred whispered allegations of “interference”. The withdrawal switched the fortunes of the People’s Democratic Party (PDP), which was in the opposition since the kingdom became a constitutional monarchy. In the primary round of polls in May, PDP trailed the ruling Druk Phuensum Party but came out on top in the second round of polls in July. PDP’s leader, now the prime minister, Lyonchhen Tshering Tobgay, is seen as being pro-India. The Bhutanese see the withdrawal of subsidy as a crude attempt by India to influence the elections. They are unambiguous that India did this to teach Bhutan a lesson. India felt its former prime minister Jigme Thinley was cozying up to China, Bhutan’s other giant neighbour. In 2012, Thinley met that country’s prime minister Wen Jiabao in Rio de Janeiro. Under Thinley’s leadership, Bhutan was also planning to open diplomatic relations with China. Bhutanese say this is realpolitik; they have to strike a balance in their relations with their two giant neighbours. They hold regular talks with China to settle the demarcation of the international border. 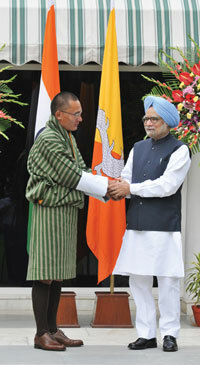 But Bhutan’s expansion of international reach irked India, which has so far handled Bhutan’s foreign policy. In August, after India refused to shell out Rs 550 crore as the remainder of its commitment for Bhutan’s 10th Five Year Plan, Bhutanese look at India as a cantankerous parent. To improve the souring relation, Bhutan recently bought two helicopters from India for search and rescue operations as proof that bilateral ties were going strong. While Bhutan looks up to India for growth and development, India’s interest in Bhutan is obvious. Bhutan is strategically located as a buffer against China. It is also a source of cheap and abundant electricity for India’s north-eastern region. Though India sees GNH as a hurdle to expand hydel projects in Bhutan, foreign ministry officials say it will continue to provide grants and loans to the government. This effectively ties Bhutan’s economy and future to India. As Bhutan taps its abundant rivers and streams to generate hydropower and expands the scope of tourism, it will be interesting to see how the kingdom retains its forest wealth and principles of GNH. Its balancing act holds lessons for the world. Excellent Coverage on Bhutan and its economy. I have beautiful 2D,3D,Metallic,Scented Gramaphone Record Stamps from Bhutan.